In my view the answer to the question raised by Raymond regarding the undetected actions of this drug regime is to be found both at a gene transcription level and within the domain of the delicate balance that typifies the maternal endometrial immune and communication systems. Research by Piccinni (2007) highlights the complex interplay between various immune regulating chemicals at the fetomaternal micro-environment leading up to implantation, as the following quote attests. "It is apparent that an immunological mechanism may play a role in pregnancy and embryo development." Amongst the vital factors (technically known as cytokines) listed by Piccinni are IL-4, IL-10, M-CSF and LIF which are produced "at the fetomaternal interface" and "could contribute to the maintenance of pregnancy." Interestingly this researcher reported that these crucial pro-implantation immune factors were produced both by the cellular envelope (known as the cumulus oophorus) which surrounds the oocyte "during ovulation" and also the embryo prior to implantation. A number of essential aspects of the work by Piccinni require expansion. Second, the balance between these two competing groups of cytokines determines the sustainability of the pregnancy. Piccinni has shown that in women who experience unexplained recurrent abortion (URA) there are defective levels of LIF, M-CSF, IL-10 and IL-4 . Joined to these anti-implantation actions are other delicate molecular aspects to the processes of implantation which have been considered as potential attack points for post-coital drug regimens. Precisely how these actions exert their influence is an emerging field of research and conflicting data exists. (5) Furthermore, as research technologies become more sophisticated, some earlier conclusions apropos of the mechanisms of action of post-coital drugs and devices are subject to modification, clarification or rejection. Vital to this discussion is the overarching fact that these implantation factors are, in-vivo, regulated either directly or tangentially by ovarian-derived estrogen (E2) and progesterone (P4). Therefore, it is biologically plausible to expect that synthetic estrogens and progestins, such as those found in contemporary formulation of the daily birth control pill, and administered at higher doses as a 'morning-after' treatment, would also adversely influence various implantation factors. This is a reasonable expectation for two reasons. First, the synthetic hormones present in the once-a-day birth control pill bind to and interact with the same receptors that natural estrogen and progesterone attach to. The receptors have the task of receiving the respective hormones, rather like a lock (the receptor) receives a key (the hormone), resulting in a biological effect. This hormone/receptor interaction is one of the foundations upon which the birth control pill was developed. Because of this mutual affinity for the same receptors, it is not surprising to find that the artificial female hormones can mimic, or even disrupt the normal cyclical patterns within the endometrial environment. Given that research has revealed how the daily pill format negatively interferes with the complex array of events necessary for implantation of the human embryo, it is pharmaceutically logical to conclude that a sudden, seven-fold intake of the same hormones would likewise impact adversely on the delicate process of implantation. The earlier mentioned findings by Raymond et al (2000) support this conclusion. The following discussion will review newer research findings which highlight the possible attack points at which the Yuzpe method of pre-implantation/emergency 'contraception' could be operative. Initially, these hormones could interfere with the mandatory bio-chemical communication between the embryo and the maternal endometrium prior to implantation. This precise, structured maternal/embryo communication has been varyingly referred to as "a signalling system",(7) embryonic "dialogue", (8) "molecular communication" (9) and "cross-talk." (10) Piccinni has summarised the complexities of the pre-implantation process as requiring "exquisite dialogue"(11) between the human embryo (at the blastocyst stage), and the maternal endometrium. Analogously, this process could be likened to the communication between a spacecraft and mothercraft prior to docking. The interleukin system is an indispensable component of pre-implantation embryo/endometrial communication. Inappropriate levels of female hormones or the ratio between the two has been shown to have a detrimental affect upon this implantation factor at the critical stage of alignment of the human embryo with the receptive cells of the endometrium prior to implantation, a "docking" style operation known as apposition. (13) As previously discussed, the Yuzpe method obviously meets the criteria of 'inappropriate levels'. Sequentially associated with embryo/maternal cell-talk is the requirement for holding structures to be adequately present on the surface of the endometrium. These structures will maintain proper embryo/endometrial cellular contact whilst the embryo completes the implantation process. This life sustaining attachment/implantation process is, in part, dependant upon the adequate expression of cell adhesion molecules known as integrins. 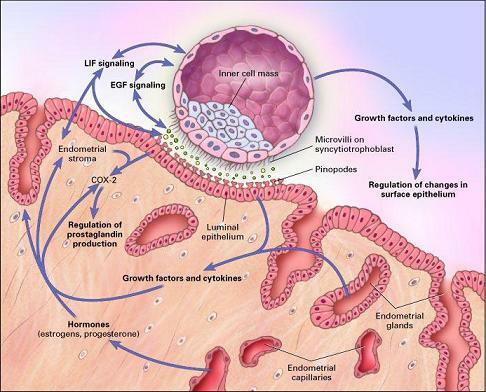 Integrins are maximally present on the surface of the endometrium on the 6th day after ovulation. This day marks the "opening of the implantation window." (14) Integrins could be considered to have the task of operating as docking clamps. Regular use of the daily pill has been shown to down-regulate the activity of integrins, notably the αvβ3 class, thereby minimalising the possibility of successful implantation. (15) It is reasonable to hypothesize that substantially higher dose of the pill, as a post-coital pre-implantation/emergency regimen would be even more deleterious to the levels of integrin expression. Consequently, implantation would be imperilled. This life cycle of less than 48 hours must be recalled when reading papers that claim that various forms of PCC do not affect pinopodes levels. The study may simply have been conducted outside of the narrow frame of pinopode presence. Leukemia inhibitory factor (LIF) has also been confirmed as vital to embryo attachment and implantation. (20) An excessive plasma level of progesterone has been shown to decrease LIF levels 2.3 fold, thereby impeding implantation. An excessive level of estrogen has also been shown, in mice, to significantly stimulate LIF production. Paradoxically, too high a level of LIF is also disadvantageous to implantation, due to LIF-induced endometrial under-development. (21) Excessive levels of synthetic female hormones are a trademark of the Yuzpe method; hence interference with implantation, via damage to the proper levels of pinopodes, osteopontin and LIF is biologically plausible. Insulin-like glucose factor-1 (IGF-1), insulin-like glucose factor-II and their related binding protein also have a confirmed, vital role in implantation, (22) and their influence on fetal development begins prior to implantation. (23) These implantation factors are under hormonal control (24) and daily use of the birth control pill has been shown to increase the levels of the binding protein (IGFBP-I) (25) (26) and decrease the levels of IGF-I. (27) Research indicates that excess levels of IGFBP are possibly implicated in shallow implantation and subsequent premature pregnancy loss. (28) The Yuzpe method of supra-physiological synthetic hormones ingestion would be expected to have an adverse impact on IGFBP similar to, if not greater than that seen with the daily pill. Clearly, as this research indicates, implantation is not akin to two pieces of sticky Velcro randomly touching and adhering to each other. Irrespective of how the Yuzpe method works at a molecular level, there is little debate that it greatly reduces the number of expected pregnancies. Ipso facto, this drug regimen cannot be classified as a contraceptive. It is a pre-implantation/emergency abortifacient. (1) D'Hauterive P, Charlet-Renard C, Dubois M et al. What's new at the maternal-foetal interface: role of the hCG/LH-hCG receptor couple during embryo implantation. Rev Med Liege. 2006;61(10):705-12 (in French). The concept that human reproduction is a dual paradox is contained within the first sentence of the abstract (in English) from PubMed. (6) In the space of 12 hours, The Yuzpe method requires a woman to take 0.2mg of ethinyl estradiol (the synthetic estrogen) and 1 mg of levonorgestrel (the progestin). By comparison, Microgynon 30 contains 0.03mg of ethinyl estradiol and 0.15mg of levonorgestrel. This latter dose is ingested once every 24 hours. (7) Simon C, Mercader A., et al., Hormonal Regulation of Serum and Endometrial IL-1α, IL-1β and IL-Ira: IL-1 Endometrial Micro environment of the Human Embryo at the Apposition Phase Under Physiological and Supraphysiological Steroid Level Conditions. J Reprod Immun 1996; 31: 165-84.